Scientific reports 8.1 (2018): 11909. The study of network topology provides insight into the function and behavior of physical, social, and biological systems. A natural step towards discovering the organizing principles of these complex topologies is to identify a reduced network representation using cohesive subgroups or communities. This procedure often uncovers the underlying mechanisms governing the functional assembly of complex networks. A community is usually defined as a subgraph or a set of nodes that has more edges than would be expected from a simple, null distribution of edges over the graph. This view drives objective such as modularity. Another perspective, corresponding to objectives like conductance or density, is that communities are groups of nodes that have extremal properties with respect to the number of internal edges and cut edges. Here we show that identifying community boundaries rather than communities results in a more accurate decomposition of the network into informative components. We derive a network analog of Gauss’s law that relates a measure of flux through a subgraph’s boundary to the connectivity among the subgraph’s nodes. Our Gauss’s law for networks naturally characterizes a community as a subgraph with high flux through its boundary. 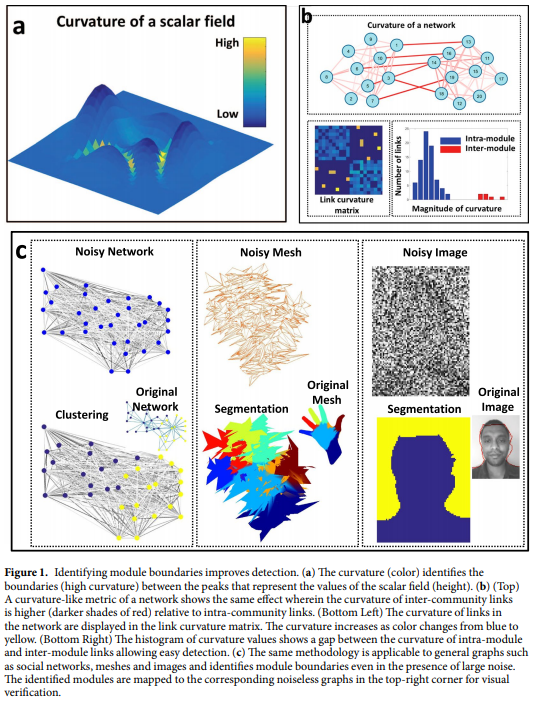 Aggregating flux over these boundaries gives rise to a Laplacian and forms the basis of our “Laplacian modularity” quality function for community detection that is applicable to general network types. This technique allows us to determine communities that are both overlapping and hierarchically organized.